Product description, add-ons, VAS (value-added services), pricing per item, multi currency exchange rates, discount management, varied charging options by volume, plan type, duration, payment method, etc. Diverse methods for computing charges, based on usage or subscription, including: tiered, stair-stepped, prorated and complex usage conditions; shared accounts including multiple subscribers such as a family, department, or organization, by which payment can be offset by users who exceed their allocation with others who underutilize theirs; proration is applied when users switch between plans. 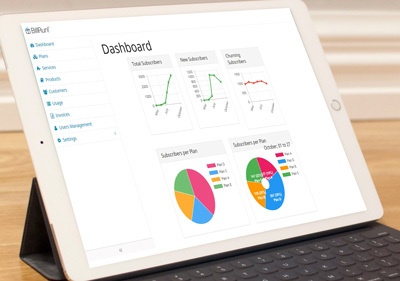 Online reports displaying subscriber usage summaries and trends; multiple sorting and filtering options; monitor subscriptions, churn, ARPU, lifetime value, etc. Customer and partner management Customer or subscriber information; hierarchical structure for easy monitoring; payment details, usage history, detailed usage records (CDRs) in multiple template formats; upload existing records in various formats; partner engagement terms, reseller plans, billing-on-behalf-of (BoBo) for partners, agents and promoters. Multiple e-invoicing templates for flexible invoice layout, taxes, integrated payment gateways, including PCI-DSS gateway to all credit cards; credit card clearing; connectors for PayPal and for online checks.